“Diodes are the ‘traffic lights’ of electrical devices: they determine whether or not electricity is able to pass through a circuit. Chip manufacturers strive to make them as small as possible, so that they can fit the maximum possible amount of components on a chip. When the ‘lights’ are green, the diodes need to ensure a good flow of traffic, but they also need to ensure that as little electricity as possible can ‘jump the lights’ when they are red. 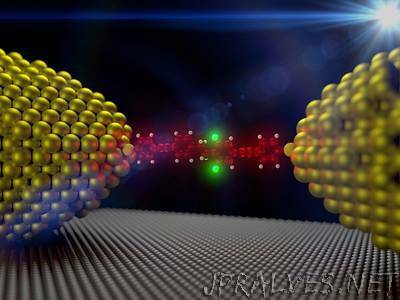 TU Delft researchers have successfully manufactured a diode using just a single molecule. At 600, this diode’s ratio of red to green (in technical jargon: its rectification ratio) is significantly higher than in earlier research (15). The researchers were also able to make the diode ‘tuneable’ for the first time. They recently published their research in the international journal Nanoscale. In line with Moore’s law, electrical components such as diodes and transistors are getting smaller and smaller, and computers are getting faster. Researchers are currently conducting fundamental research into components consisting of individual molecules – in theory the smallest possible components. ‘The first single molecule diode was created in 2005,’ explains doctoral candidate Mickael Perrin. ‘It works, but up until now, diodes like that were pretty poor traffic lights: about ten times as much electricity passed through when the ‘lights’ were green than when they were red. To stick with the traffic light analogy, you could say it resulted in considerable chaos on the roads. It is not very impressive when compared to the ratios of classic diodes, in your laptop, for example. They achieve ratios of up to 10,000 or 100,000’.